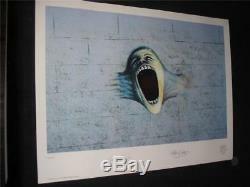 PINK FLOYD - P/SIGNED & NUMBERED LITHOGRAPH - THE WALL - 19.5" X 26". THIS PHOTO IS A STOCK PHOTO ONLY, YOU WILL RECEIVE A DIFFERENT LIMITED EDITION NUMBER. THIS PARTICULAR LITHOGRAPH HAS A 1CM TEAR IN TOP OF THE WHITE FRAMING AREA. ONCE FRAMED IT WILL BE COMPLETELY HIDDEN AND THE OVERALL VALUE WILL NOT BE AFFECTED. This amazing item has been plate signed and numbered by Gerald Scarfe and Roger Waters as can be seen in the photos. This very collectible item also contains the official Pink Floyd stamp which is located on the bottom right hand signed of the lithograph, this item was officially released in 1995. Pink Floyds MARCHING HAMMERS & THE WALL was an amazing achievement for both Roger Waters and Pink Floyd, The imagery for the movie, designed by artist Gerald Scarfe is both disturbing and brilliant. This officially released limited lithograph is taken from the original art done by Gerald Scarfe, the paper stock used for this lithograph is a thick glossy paper stock. If your into your music in a serious way be sure to take a look at our other auctions. There are some very rare. Items available, some of the artist's are. DRE, ANTHONY KIEDIS, MICK JAGGER, JOSH KLINGHOFFER, FLEA, THOM YORKE, BONO, TAYLOR HAWKINS, EDGE, RONNIE WOODS, DAVE GROHL, THE USED, RADIOHEAD, RAMMSTEIN, KATY PERRY, ROB ZOMBIE, GERARD WAY, TRENT RENZOR, KEITH RICHARDS, MY CHEMICAL ROMANCE, B. KING, JOHN LENNON, RINGO STAR, REM, ALICE IN CHAINS, JOHN MAYER, PINK - ALECIA MOORE, GREEN DAY, MIKE McCREADY, PATRICK STUMP, NIKKI SIXX, MICK MARS, AXL ROSE, JOHN FRUSCIANTE, RED HOT CHILI PEPPERS, BLINK 182, SLASH, EDDIE VEDDER, FALL OUT BOY, ROBERT SMITH, METALLICA, ROGER WATERS, FRANK ZAPPA, NEIL YOUNG, ERIC CLAPTON, THE POLICE, BRUCE SPRINGSTEEN, DISTURBED, LED ZEPPELIN, KISS, PEARL JAM, AC/DC - BLACK ICE, TOOL, ALICE COOPER, THE ROLLING STONES, THE BEATLES, NINE INCH NAILS, NIRVANA, DAVID BOWIE, BOB DYLAN and GUNS N ROSES just to mention a few. Large framed items will take 2 to 3 days to be posted due to the extra packing that is required. Our # 1 priority at Native_Dazza_Direct, is having you 100% satisfied, about our products and fully delighted with our service. Our feedback defines our commitment and dedication to providing you with the highest quality of professional customer service. For international enquires, please be aware of the time difference. Some enquires may take several hours to be answered, if your message is received outside of our scheduled business viewing hours. Get Images that Make Supersized Seem Small. Tailor your auctions with Auctiva's. The item "PINK FLOYD P/SIGNED & NUMBERED LITHOGRAPH THE WALL 19.5 X 26" is in sale since Friday, September 1, 2017. This item is in the category "Music\Memorabilia". The seller is "native_dazza_direct" and is located in Milton, NSW. This item can be shipped worldwide.